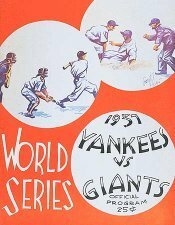 The 1937 World Series featured the defending champion New York Yankees and the New York Giants in a rematch of the 1936 Series. The Yankees won the Series in five games for their second championship in a row and their sixth in fifteen years. It also broke a tie that they had reached in 1936, with the Philadelphia Athletics and Boston Red Sox for most championships (they each had five). By the time either of those teams won their next Series, the Yankees had far outdistanced them, with 20 wins as of 1972. This was the Yankees' third Series win over the Giants, finally giving the Yankees an overall edge at that point of three Series to two over the Giants, after having lost their first two meetings in 1921 and 1922. Since then, the only member of the "classic eight" members of the National League to eventually hold a winning edge over the Yankees is the St. Louis Cardinals. This would be Lou Gehrig's last really good season before amyotrophic lateral sclerosis (ALS) began to take its toll on his career. 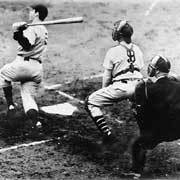 Game 4 featured the final World Series innings ever pitched by Hall of Famer Carl Hubbell who, during the ninth inning, threw a pitch that Hall of Famer Lou Gehrig hit for his final World Series home run. 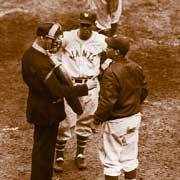 The 1937 Series was the first in which a team (Yankees) did not commit any errors. Once again, Joe McCarthy's New York Yankees dominated the American League for the second consecutive season, winning the American League pennant by a thirteen-game margin with league-leading hitting by three of the games greatest. Second-year man Joe DiMaggio drove in one-hundred sixty-seven runs, veteran Lou Gehrig added one-hundred fifty-nine and Bill Dickey contributed one-hundred thirty-three for an amazing four-hundred fifty-nine runs batted in. Gehrig, known as the "Iron Horse" had enjoyed a magnificent season that would sadly be his last before amyotrophic lateral sclerosis (later named Lou Gehrig's disease) began to take its toll on his career and his life. He batted .351 and recorded thirty-seven homers, his protégé "Joe D"; hit .346 with forty-six homers and Dickey came in third with a .332 and twenty-nine. The three were without equals at the plate, although George Selkirk was on pace (eighteen homers in sixty-eight games) and may have made it four, if not missing half a season due to injuries. The Yankees also had the American League's only twenty-game winners with Lefty Gomez (21-11) and Red Ruffing (20-7) as well as standout relief in Johnny Murphy, who recorded twelve saves and thirteen overall. However, the Yankees weren't the only repeaters in '37 as the National League's Giants returned for a classic rematch against their hated cross-town rivals. Unlike the Yankees, Bill Terry's club did not possess the dominant hitting (Mel Ott was closest with thirty-one home runs and ninety-five runs batted in), but they did boast two, twenty-game winners with Carl Hubbell (22-8) and rookie Clift Melton (20-9). Game 1 echoed the previous Series opener with the Giants on top 1-0 going into the sixth, but before the inning concluded, the Yankees struck for seven runs on their way to a six-hit, 8-1 victory for Gomez. Game 2 started the same as the Giants led 1-0 going into the bottom of the fifth. This time the American Leaguers struck for two in the fifth, two more in the sixth and headed for their second consecutive 8-1 comeback that featured a seven-hitter from Red Ruffing. Things didn't get any better for the National Leaguers in Game 3 either as Monte Pearson, getting last-out relief help from Murphy in the ninth, won — despite the fact that the Giants had loaded the bases. As the Yanks prepared to go for their fourth sweep in their last five World Series appearances, the Giants were still trying to get their first win in their last four Series games. Things seemed to finally turn in their favor for Game 4 as they managed six runs in the second inning. Center fielder Hank Leiber got things going with a base hit and then capped the rally with a two-run single. Hubbell went on to record a 7-3 victory while throwing a clutch six-hitter. In the ninth inning, the last he would pitch in a Series, he allowed a homerun to Lou Gehrig, the last he would hit in a Series. Once again, the Giants had comeback from the brink of elimination, and once again, the Yankees had an answer the following day. In Game 5, Myril Hoag whacked a second inning homer for the Yanks and DiMaggio connected in the top of the third. Ott returned fire with a two-run blast in the bottom of the inning, but Lazerri hit a leadoff triple in the fifth and scored on Gomez's single due to second baseman Burgess Whitehead's fielding error. Two outs later, Gehrig doubled home Gomez on the way to a 4-2 Series ending victory. The back-to-back titleists had won their sixth World Series championship, (breaking the mark they had shared with the Philadelphia Athletics) and they were only getting started. Believe it or not, the four-games-to-one humiliation that the New York Giants were forced to endure was only the tip of the iceberg and the defending champion's next two opponents would not find themselves as fortunate.